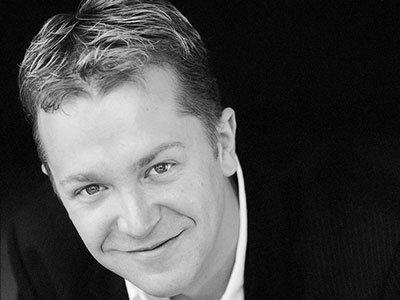 Daniel Okulitch is a leading interpreter of Mozart roles, most notably Don Giovanni, Almaviva and Figaro, which he has performed at New York City Opera, Teatro Colón, Los Angeles Opera, Santa Fe Opera, Palm Beach Opera, Opera Warsaw, Vancouver Opera, and Dallas Opera. Daniel first attracted national attention as Schaunard in the original cast of Baz Luhrmann’s Tony-winning Broadway production of La bohème. His first solo recording, The New American Art Song, was released on GPR Records in 2011. Future engagements: Brokeback Mountain (Ennis Del Mar) at New York City Opera; JFK (LBJ) at Opéra de Montréal; and a new production of Doctor Atomic (General Groves) at Santa Fe Opera. He also excels in creating leading roles in contemporary opera, including Ennis del Mar in Brokeback Mountain at Teatro Real; Seth Brundle in The Fly at Théâtre du Châtelet and Los Angeles Opera; Willy Wonka in The Golden Ticket at Opera Theatre of St Louis and Atlanta Opera; LBJ in JFK at Fort Worth Opera; and Herman Broder in Enemies, A Love Story at Palm Beach Opera.